By popular demand, the ever popular Megahalems now comes in BLACK! It has stylish black grainy matte finish for the best looking performance. 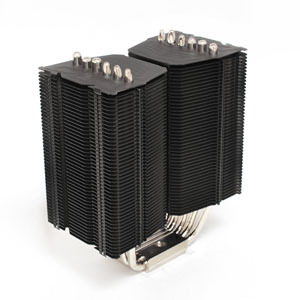 If looks could kill, this heatsink would reap havoc on any competitor in its path!! Housing this Intimidator is a specially designed package that has every look of a “Collector’s Edition”! Inside the package you get not only one but two sets of fan clips for setting up an awesome arsenal of duo fans. You also get support for installation on any of the Intel's and AMD's recent platforms. Those include Socket 775, 1366,1155/1156, and of course, the newest 2011 and 1150/1151, and AM2/2+/3/3+/FM1/FM2. No longer will you have to choose which backplate to use because a specially designed universal backplate has been created for better convenience and better cooling results. What Megahalems has set in performance standards, now Black Megahalems will raise the bar one level higher! Everything else aside, if looks are everything to you, this is the one heatsink to get!! Stylish black grainy matte finish for the best looking performance. Both 120mm and 140mm fan can be mounted on it. Minimal air resistance between fins allowing best balance between noise and performance in range of . For all out performance, fan RPM at 1600 or above is recommended. Easy-to-install retention mechanism for LGA 775, 1366, 1155, 1156, 1150,1151 and 2011 and AM2/AM2+/AM3/AM3+/FM1/FM2.